My mom gave me an article a few weeks ago from FamilyCirlce.com that talked about cutting out unnecessary holiday spending. It made some very interesting points and I thought I’d share a few with you. 1. Don’t wait until the last minute. If you do, you’ll run to the stores in a tizzy and spend twice as much as you normally would. 2. Pay with cash. We all know that you spend twice as much if you shop with your credit/debit card. For some weird reason it hurts to fork over that cash. 3. Use cash-back sites when shopping online, and hunt for coupon codes. It’s super easy to use Ebates and ShopAtHome when shopping online. It only takes a minute to sign up and start earning that cash back. You’d be crazy not to take advantage of it. 4. 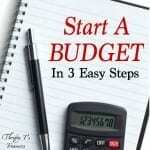 Use a list or a budget. Last year I encouraged you to start a Christmas budget. Did you do it? Even if you didn’t budget for this year’s Christmas gifts, you can still make a list and compare with what you actually have to spend. 5. Buy sets and break them up. One idea was to buy a collection of ceramic bowls and fill them with baked goods. 6. Make some presents. We’ve already talked about how much it means when someone gets a homemade gift in our Thrifty Gift Ideas series. So, get those hands busy! 7. Borrow items for your holiday party. I’m not a big entertainer but I know that some of you are, and you go all out with your holiday decorations. Borrow a set of dishes from a friend. If you need another Christmas tree, see if your neighbor will let you borrow theirs for the night. You’re creative…think outside the box. What do you do to curb unnecessary holiday expenses?